Occasional Dun Cow visitor Simon Probyn dropped by early and soon got the nod from MC Paul Grainger. Our tenor man overcame a few early squeaks and squawks due to a misbehaving dry reed to play a satisfying Days of Wine and Roses. Probyn stayed on to play Jerome Kern's Yesterdays accompanied by the ace house trio (Edis, bassist Grainger and drummer Rob Walker). Blaydon Jazz Club's Roly Veitch, back to gigging on a more regular basis, returned to the Brandling Village jam session to sit in with the trio. Our guitarist called That Old Feeling, or so your correspondent thought. Beautifully played, one wouldn't expect anything else from a GASbook devotee, it was later in the evening that RV enlightened your correspondent...the tune in question was Soon, written by the Gershwins. Alone Together (one of the great titles!) followed, the quartet joined by the returning Probyn to make it a quintet. 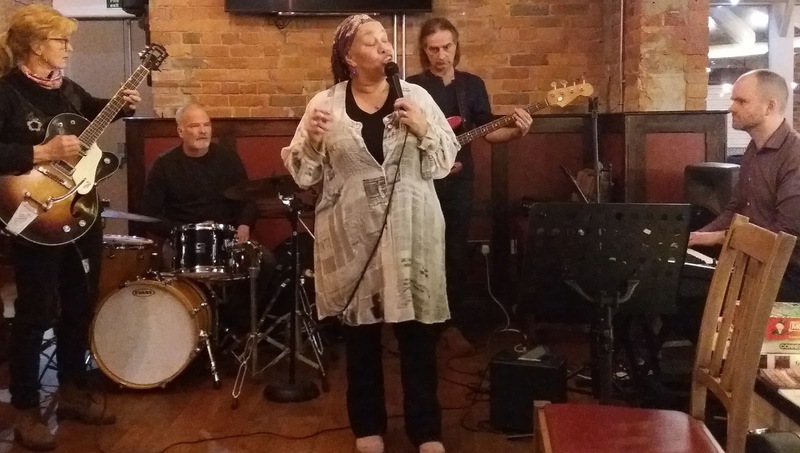 From time to time Andrea Harrison gets along to the Dun Cow to sing a couple of soulful numbers alongside guitar-playing sculptor Lisa Delarny. They like to work with Rob Walker, and after a powerful rendition of Nature Boy, RW switched to bass guitar as Archie Brown - yes, Young Buck Archie Brown! - got behind the traps as Harrison belted out What a Difference a Day Makes. One fine pianist - Dr Edis - went to the bar as another fine pianist, Edinburgh-based Martin Waugh, gave him a spell. Nice and Easy did it alright, top stuff. Better still, Waugh, this time supported by another drumming Archie (Newcastle University's Archie Williamson making good use of brushes), sang a marvellous version of You Go to My Head. Jam sessions can be a hit and miss affair, this evening's hit the bull's eye. 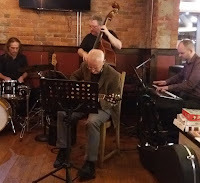 Newcastle University student, guitarist James Cuxson, joined the party, as did jam session debutant Patrick, on drums, to play Ladybird with tenor man Probyn adding his two-penneth. Cuxson and Veitch complimented one another on Out of Nowhere as circling harmonica man Ray Burns jumped in. Tenderly took us up to the bell and as the ailing Paul Grainger blew his nose, Edis' spontaneous call for C Jam Blues ensured a rousing finale.